1. SOC-3 Unit: VCS-9, US Navy. Serial: 9-CS-9 (BuNo.1134). Light cruiser CL-46 USS Phoenix, circa 1939. 2. SON-1. Unit: VO-5, US Navy. Serial: 5-O-8 (BuNo.1183). The battleship BB-34 USS New York, circa 1940. 3. SOC-3. Unit: VO-4, US Navy. Serial: BuNo.1110. BB-48 USS West Virginia, circa 1937. 4. SON-1 Unit: VCS-5, US Navy. Serial: 13 (BuNo.1141). Based at heavy cruiser CA-25 USS Salt Lake City, circa 1943. 5. SOC-2. Unit: VCS-7, US Navy. Serial: 18. Based at heavy cruiser CA-31 USS Augusta, circa 1942. 6. SOC-3 Unit: VCS-7, US Navy. Serial: 7-CS-10. Heavy cruiser CA-37 USS. Tuscaloosa, circa 1942. 7. SOC-1 Unit: US Navy. Serial: 9-S-7 (BuNo.38?5). Aleutian operations, June 1942. 8. SOC-1 Unit: VS-12S, US Navy. Serial: 12-S-5 (BuNo.9927) Based at heavy cruiser CA-36 USS Minneapolis, circa 1936. 9. SOC-1 Unit: VS-9S, US Navy. Serial: 9-S-7 (BuNo.9836). Based at heavy cruiser CA-25 USS Salt Lake City, circa 1935. 10. 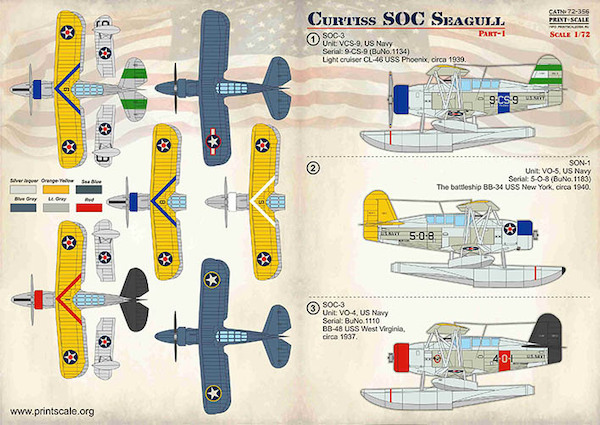 SOC-3 Unit: US Fleet. Serial: BuNo.1079 BB-38 USS Pennsylvania, circa 1939. 11. SOC-1 Unit: VCS-7, US Navy. Serial: 7-CS-6 Heavy cruiser CA-37 USS Tuscaloosa, circa 1943.